Virtual reality is being found in so many different areas and has become quite the buzz word, not just in the entertainment world. 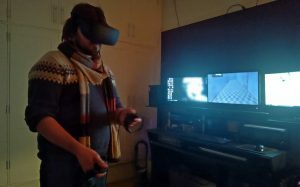 With networks creating VR experiences of popular TV shows at conventions and VR experiences becoming a part of film festivals like Sundance, it’s exciting to see the developments being made, blurring the lines between cinema and gaming. Perhaps some new hybrid creature will emerge from this convergence, the new experience of ‘Cinematic VR’. Who knows exactly where it’s going? With this VR beast being so cutting edge, it may not have been an expected area for a micro-budget independent film to step into, but that is where we find ourselves with the development of the Shadows of a Stranger Virtual Reality Game. Having produced a CG-based film and creating numerous 3D environments as we built our storyworld of Meridian, we also kept an eye on the VR developments in anticipation, knowing that Shadows of a Stranger lends itself perfectly to this new platform. That’s when fellow Stranger Andy Taylor (writer and performer of the song in Satan’s Cellar, Lost) stepped up to develop the app. So what’s this VR game all about? You are placed into the shadowy city of Meridian, into the opening scene of the film where Asmo has left behind his murder scene. 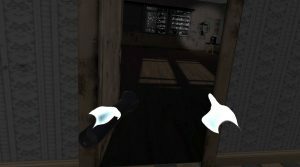 Instead of the policemen bursting in, you are given the mission of entering this environment and solving a mystery in order to complete the game. To help you on your challenge you have the assistance of one of the central characters, the psychic Xander, who uses his powers to talk to you and act as your guide. 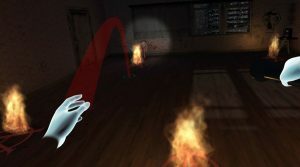 The game is truly a mind-blowing experience, something that has not been possible for indie filmmakers of this size of production, where the audience will be able to authentically experience the world of Meridian that they saw on TV and cinema screens, as the very same textures from our production have been used to create this VR world. And more than that as the VR world is augmented with new elements and new narratives as we expand the world and demonstrate a possibility for so much more. VR expands the universe for films, allowing the viewers to submerge themselves in it, exploring new things, becoming a part of the narrative and making friends with the characters. It’s perhaps only a matter of time before the platform will be embraced even more, when it becomes a thrilling companion between episodes of TV shows, or people can explore the far, far away worlds of cinema without having to go a theme park.